Dowsing has been around in some form or another for thousands of years, and the tools can be made from various materials, Hazel twigs, Wire which has been manipulated into various shapes. 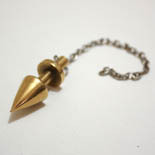 And then there is the Pendulum, which can be made up of a multitude of materials, but is commonly seen either as a crystal, glass, or wooden drop with a thin chain or leather thong attached to the drop itself. The only criteria being, that the drop is heavier than the length of chain or leather it is attached to, in order that it may swing freely. Basically, the pendulum when used properly can be best described as a telephone receiver, which when picked up acts as a through line to spirit. And it can be the easiest method of communing with your spirit guide, as it requires no skills, no rituals, no qualifications of any sort, just the ability to open your mind, and allow your guide to communicate with you via your pendulum. Once you acquire a pendulum, and it can be as simple as a washer tied with a length of thin string. You should in the first instance cleanse it thoroughly, with all types you should first wash it gently in a mild solution of soapy water, rinse and dry it well then immerse the drop in a small container of sea salt (dry) for a period of 24hrs, to thoroughly cleanse it of all negative energy. After 24hrs, remove it from the sea salt and rinse drop under running cold water until all traces of sea salt are gone, leave to dry and then it will be ready to use. It is a good idea however to give the drop a cleanse about once monthly when in use, but you only need to leave it in the sea salt for a couple of hours. 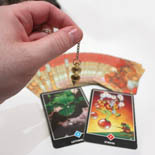 Once you are ready to start using your pendulum, put out of your mind all cares of the day and try to open yourself to receive, sometimes a short meditation when first starting can help those who find it difficult at first to completely relax. Forget all notions of ‘ being controlled by another being ‘, or any similar negative anxieties that simply are a result of pre-conceived views and misunderstandings given to you by people or books. These views simply show the total lack of true understanding of spirit, and what spirit hopes to achieve.There are a few basic rules, and if followed will enable you to quickly develop a deepening spiritual bond which will provide you with the ‘ best friend ‘ you’ve ever had, a non-judgmental, loving, non-evasive, protective spiritual guide and friend. Allow fears to prevent you from using your pendulum. 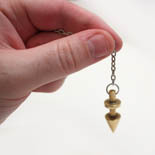 Use the pendulum when you are tired, or stressed. Allow others to use your pendulum, as all other vibrations can interfere with the intricate vibrational bond between you and your spirit guide, especially when you are first starting out. Use your pendulum knowing that any answers you receive from spirit are only given based on love. Always find your ‘yes & no ‘ movements before anything else. Then when you are getting a little more adventurous you can if you wish, start to use the letters of the alphabet, to increase the depth of your answers. When asking questions, make them short and simple, and precise, until you get experienced enough to hold lengthy and involved conversations.If when first starting, you find your pendulum is sluggish in movement, slip your free hand underneath the pendulum to get a little extra energy, and usually you will find the pendulum will move more freely. Learn to distinguish your own mind from accurate spirit answers, as your own mind is so powerful, you must be aware that you can influence the movement of your pendulum. But with experience and time you will learn to distinguish this if it ever arises. Don’t be afraid of your pendulum, enjoy it and use it only ever for the good of mankind.